The Boston University Police Department received eight accounts of group disturbances, seven accounts of intoxicated students on the Charles River Campus and one account for noise complaints between midnight and 8 p.m. on the Monday of the 2016 Boston Marathon, according to BUPD crime logs given to The Daily Free Press. Between 9:59 a.m. and 11 a.m., BUPD received four calls regarding group disturbances at a number of locations on and around campus. By the time BUPD officers arrived at two of the locations, services had been rendered. At one location, the group was gone upon arrival, and the Brookline Police Department was notified of the remaining incident as it did not happen on BU’s property, the crime logs showed. 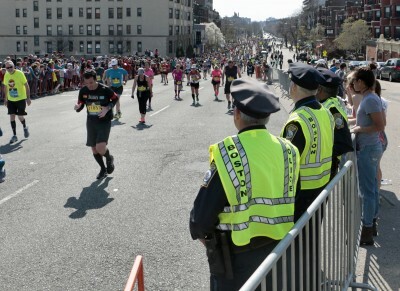 Many BUPD units were active on the day of the marathon, but not all were stationed in South Campus near the marathon route, BUPD Sergeant Dan Healy said as he sat in a BUPD car at the intersection of Park Drive and Buswell Street in BU’s South Campus. Near Healy’s parked car, students gathered around grassy front yards and watched the marathon runners as they made their way down Beacon Street. Many students lined the blockades that separated the route from the spectators. Healy said the “nice weather and exciting atmosphere” made more people come out and enjoy the city. He spoke positively of the students he had interacted with by 2 p.m.
BUPD has recorded a total of 35 crimes on Boston Marathon day occurring between 2012 and 2015. Of those crimes, 17 were medical assists, with 14 being alcohol-related, according to BUPD’s cumulated crime logs given to The Daily Free Press. This year, however, reports of noise disturbances significantly increased, as the crime logs showed that none were reported between 2012 and 2015. In preparation for this year’s marathon, BUPD increased the number of “uniform and plain clothes officers in the areas to keep our community safe,” Scott Paré, BUPD’s deputy director of public safety, wrote in an email. BU students received an email Friday afternoon reminding them of items prohibited in the vicinity of the marathon track. Various checkpoints along the route were also set up to ensure that none of the prohibited items entered the viewing areas, according to the email. Healy said many police departments in the Boston area joined together to guard the areas surrounding the route of the marathon. Several BU students said BUPD’s presence and various security checkpoints along the marathon route made them feel safe. Laura Lazo, a junior in the College of Arts and Sciences, said the security checkpoints were a helpful added measure of protection. Chandler Hennig, a sophomore in CAS, said he felt safe watching the marathon and was happy to have security provided by BUPD and BPD. Sheyenne Walmsley, a junior in CAS, also said she felt safe the entire time she was watching the marathon. “I don’t think there was a point at all [during the marathon] that I felt uncomfortable or in danger,” Walmsley said.